Would you put the oxygen mask on yourself first to better help your children? Last week we went on a family vacation to Arizona for spring break. As we were getting ready for take off the flight attendants went through the traditional safety brief. For the first time it dawned on me the parallel between putting the oxygen mask on yourself first before assisting others, and the need to work on your own relationship with food and body when raising your children. I’ve always found this interesting because as a mom my first instinct has always been to put my daughter’s needs in front of my own. Can any of you relate? #momguilt is real! However, it’s true if we don’t give ourselves oxygen how could we possibly be able to help our child, right? Well the same thing rings true for raising your children to have a good relationship with all foods and their body. Yes, of course you want better for them, but how can you do better for them if you haven’t done your own work around your body and food? For those of you that have been reading my blog for years know I talk LOTS about how to feed your children. Many, many parents struggle with the trust model of feeding kids. Why? It comes back to, if you don’t trust your own body and eating how can you trust your children? Believe me this doesn’t come from a place of judgment, but a nod of acknowledgement. I can understand because I was once there too! It didn’t take me long to realize in order to raise an intuitive eater, I had to learn to be one too! So, what does that mean or even or look like as a parent? You can read more about the Intuitive Eating Principles here if you want to dive deeper. Think about this example: A teenager just said to me the other day – my parents keep telling me to get off my phone, but they don’t get off theirs. How can you argue with that because she was right – we are their biggest role models. Do you Feel Okay Eating All Foods? What fears do you have around food? Are their foods that you feel bias about – meaning do you believe that there are “bad” and “good” foods? Do you notice that you struggle serving the foods you deem as bad or are particularly stressed about “getting” your kids eating the good food? If you answered yes to any of these questions it may indicate you have bias around food and could be getting in the way of you serving those foods to your children. I recently talked about this in my blog post here because sometimes I have to check myself too. Take Home: There are no “good” and “bad” foods. Teaching and judging food as ‘healthy’ or ‘unhealthy’ is saying their is morality to food. 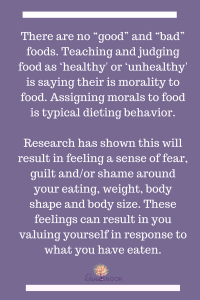 Assigning morally to food is typical dieting behavior. Research has shown this will result in feeling a sense of fear, guilt and/or shame around your eating, weight, body shape and body size. These feelings can result in you valuing yourself in response to what you have eaten. For example: Cookies are bad for me, when I eat a cookie I’m bad. We’ve all heard it at a dinner party, I’m going to be bad tonight and eat (insert food or drink). Rather than looking at food in concrete terms – look at focusing on eating based on your needs and wants. Our bodies crave what they need when we stop to listen. Do You Trust Your Own Appetite? I’ve heard it many times with the families I’ve worked with. After much work together a parent will say to me, “ How can I trust my child to stop when they are full because I can’t even trust myself to stop when I’m full?” Have you ever had those thoughts when feeding your own children? Are you afraid you can’t stop and your children can’t learn either? We are born with an innate ability to self regulate our intake. Think back to when your children were newborns. They ate, stopped when they were full, and cried when they wanted to eat again, getting exactly enough for their bodies. We can do that too, but sometimes this means learning to do it again. When we have grown up with strict food rules or dieting it can interfere with you connecting with and listening to your body. Take Home: Start with giving yourself permission to eat the food you are wanting. Sit down at a table and focus on eating the food, taste the food and enjoy it. Your body will do best when you give it full permission to enjoy all foods. 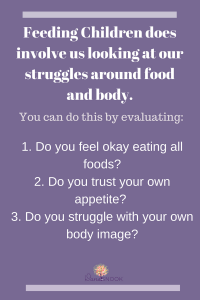 Do You Struggle with Your Own Body Image? How do you feel about your body? Have you spent years trying to control your size? Do you get on a scale often? Do you continuously fat shame your body? Are you squeezing into uncomfortable clothes that don’t fit? It’s not surprising because our society is highly focused on bodies and how to make them look smaller, younger, more muscular. When children learn that body size is important or it’s not okay to be in a larger, less perfect, older body, it can cause struggles around their own bodies. 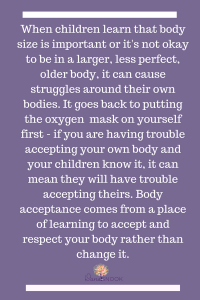 It goes back to putting the oxygen mask on yourself first – if you are having trouble with accepting your own body and your children know it, it can mean they will have trouble accepting their own. Take Home: If only body image was as simple as a few tips. It’s not. If you have struggled to accept your body for a long time, consider seeking out a mental health professional or dietitian who specializes in body image (this does not including trying to “get” you to lose weight so you’ll feel better about your body). A few things to think of – one of the first things is body acceptance, this comes from a place of learning to accept and respect for your body. Can you focus on what you body has done for you? 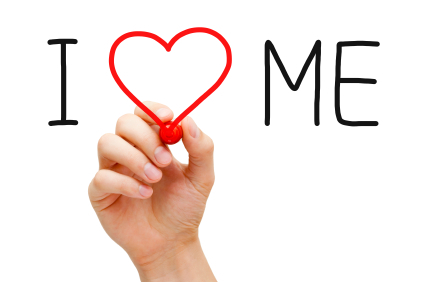 Can you focus on 5 things that are great about you? Maybe aspects like great listener, good friend, compassionate person, etc… When you start to struggle around your body – repeat these things to yourself. In addition, try to focus on what your body does do for you. Did your belly give you the ability to carry your beautiful children? Do your legs give you the strength to run after your children or move heavy things? Do your arms help you to carry your children or play the drums? Learning to appreciate what your body can do for you can help to reframe those negative thoughts. Depending on how long you’ve struggled with having a good relationship with food, appetite or your body you might notice that you could use help in this so that you can help raise your children with a better relationship with food and their body. I my Intuitive Eating Mastermind coming up!